Stella Adler came from a family of distinguished actors. Her father, Jacob P. Adler, was one of the giants of the Yiddish theatre in America, known as "The Great Eagle" for his imposing profile and presence. Stella's brothers and sisters were actors and her second husband was Harold Clurman, the distinguished director and critic. Stella herself first appeared on stage when she was five years old, in one of her father's plays. She went on to act on Broadway and London, and to study acting with Stanislavsky in Paris, which led to her joining the faculty of Erwin Piscator's Dramatic Workshop at the New School. In 1949 she started her own acting school, which allowed her to refine her theories and principles over a forty-year period. She died in 1992 at the age of 91, but her school still exists (on both coasts) and likewise her interpretation of the Stanislavski acting system, better known as The Method. Her students over the years have included some of the luminaries of the American stage: Morris Carnovsky, Elia Kazan, Robert Lewis, Sanford Meisner, Lee Strasberg, Marlon Brando, Elaine Stritch and Sam Shepherd, to name just a few. 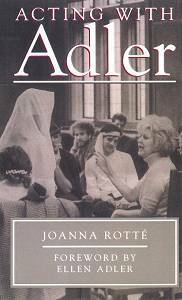 Now another of her disciples, Joanna Rotte, has put together a book containing just about all of Adler's wit and wisdom. Acting With Adler (Limelight Editions, 118 E. 30th St., NY, NY 10016, www.limelighteditions.com) is based on the notes that Rotte took over a three-year period while studying with Adler, plus Adler's own extensive lesson plans and notations. The result is a textbook which any aspiring actor will find valuable and instructive. Since Adler was such a well rounded human being, one who had read widely in psychology, literature and history--and who was street-smart and down-to-earth as well-- her book can be read to good purpose by even a theatre layman. Here, for example, was what she felt was essential to maintaining the craft of acting: "If an actor were really serious, and lived in a serious theatrical community, he would stop acting every five years to repeat his early muscle training--to clean up, to stop the indicating, to see where it has gotten faulty. Musicians do that. They take off six months to go to Switzerland to practice. I lived next to the virtuoso violinist Nathan Milstein, and let me tell you, he practiced every day. He practiced scales. He didn't practice a piece. Well, these muscle exercises are the scales." As Rotte shows, Adler felt there were basically two kinds of performers: those who transform themselves and those who do not. "Her dictum was that you cannot play yourself on stage, if only because yourself is too unenergized. Though she noted that one job of the director is to help the actor create the live character, knowing the actual conditions in commercial theatre she advised developing the ability to characterize on your own." Characterization to Adler meant changing oneself to fit the character, not changing the character to fit oneself. "Today, in our theatre, there is no training for characterization...You simply have to make up your mind to have a range of parts that you can play. I want you to play parts that demand absolute characterization. You cannot play the Devil without being costumed in character. You cannot play Puck, you cannot play Caliban without it. I want you to take parts for which you have to say, 'There's nothing about me that I can use. I have to change everything. I have to die.' Take big, big parts. Take Peer Gynt. He has nothing that you have. You will have to change." Adler's last words, as reported by the author in her insightful and engrossing book, were: "Your biggest contribution is to find the self you did not know."